Newly typeset – Fully menukad – It will transform the way you learn Navi! 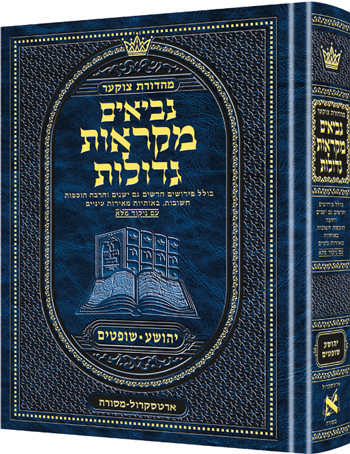 The best-selling Czuker Edition Mikra’os Gedolos Chumash now continues with an unprecedented Mikra’os Gedolos on Nevi’im. Many mefarshim never before together on the Mikra’os Gedolos page – with many new additions. Classic Mikra’os Gedolos commentaries: Targum Yonasan ben Uziel, Rashi, Radak, Rid, Ralbag, Minchas Shai, Biur HaGra, Mezudas David, Mezudas Tzion, Malbim Plus These Additional Commentaries: Mahari Kara, Maharal, Minchah Ketanah, Rishon LeTzion, Chomas Anach, Yesod VeShoresh HaAvodah. Likkutei Shas U’Medrashei HaTannaim – An original comprehensive compilation, citing relevant texts from Talmud Bavli, Yerushalmi,and major Midrashim where a verse is discussed. Baal HaTurim – An original collection of comments by Baal HaTurim on Chumash explaining verses in Nevi’im Sifsei Zekainim – Anthology of classic commentaries explaining Rashi’s commentary on neviim.